-Indicating Silica Gel Packets fit most underwater camera housings! -Moisture Absorbing Packets of Silica Gel are Non-Toxic and Inert, will absorb up to 40% of it's weight in moisture! Fight Fogging, Mildew, Mold, or Corrosion Issues With Our Silica Gel Packets! Dry-Packs Scuba Indicating Silica Gel Packets fit most underwater camera housings! 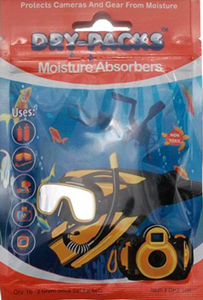 Bag Contains: 10 Indicating Silica Gel Packets,Item Number: DP2-10R Bar-Code: 898026002289 These Dry-Packs Moisture Absorber Packets are the ideal size for numerous applications like underwater camera housings, camera gear, scuba gear, camera housings, electronic bags, digital cameras, shoes, leather items, camping gear, backpacks, tackle boxes, gun cases, storage boxes, tool chest, coins, crafts, etc. Our Indicating Silica Gel Packets do NOT contain Cobalt Chloride (II) (Indicating Silica Gel that is usually blue in color which has been linked as being possibly carcinogenic to humans and been labeled as hazardous material in some countries). Our Indicating Silica Gel is reformulated to remove Cobalt Chloride (II) which provides our customers with safe Indicating Silica Gel Packet to use. Our Indicating Silica Gel beads are Orange when dry and will turn to Dark Green when 60% absorbed with moisture!